S. aureus and particularly MRSA have been considered as the prototypes of hospital-acquired pathogens. However, recent observations demonstrated that MRSA is now responsible for severe community acquired diseases. Confronted to this epidemiological evolution, we currently need to improve our knowledge about pathogenicity and virulence as well as to understand the basis of “successful clones” that have shown particular ability for spreading in different settings, either in the hospital or in the community. We hypothesize that parameters contributing to these characteristics of virulence or invasiveness are parts of the genetic material of isolates. In this context, we based our research on the development and utilization of massively parallel methods of molecular analyses as well as customized bio-informatics solutions allowing such studies at the genome scale. Among the genetic information, intergenic regions represent potentially interesting targets, often neglected until recently, to be explored for their contribution on the epidemicity and the virulence of the bacterium. 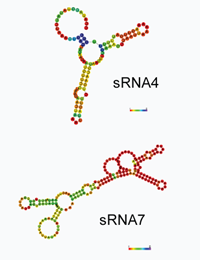 Very recently, small RNAs (sRNAs) have been described and identified as potent regulators of many bacterial genes such as metabolic or virulence genes. This study aims to establish a complete inventory of sRNAs in a model strain of S. aureus clinical isolate, using high-throughput sequencing technology. Initial characterization will permit to evaluate their expression during the growth time as well as different culture condition (pH, temperature shock, etc …) mimicking in vivo infection conditions. Mutants will be used to study the role of defined targets during the development of the infectious process. In the same context, point mutations appearing spontaneously or under selection pressure in specific genes will be evaluated. Fascinating reports have shown that the sequence polymorphisms (SNPs for Single Nucleotide Polymorphism) could explain epidemiology or medical outcome in the context of chronic infections (e.g. Pseudomonas aeruginosa and CF patients). These modifications affect not only house-keeping genes but also virulence genes, the latter one with much higher frequencies. We plan to identify single nucleotide polymorphisms at the genome scale by comparing clonal S. aureus strains from the same patient and from two different infection phases. This evaluation will be performed on the entire genome including ORFs as well as on non-coding sequences. The correlation between this information and clinical and/or epidemiological parameters will be performed though our institutional patient database. These determinations will allow appreciating micro- and/or macro-evolution of S. aureus, genome notably MRSA, and identifying specific genomic regions of particular relevance for evolution, adaptation and virulence of this frequent human pathogens. For more information, download the awarded poster presented by Marie BEAUME during the 2009 Swiss Society for Microbiology meeting.